Set on High Street in the heart of town, graduates-only All Souls College is Oxford’s most elitist institution. Only the university’s best and brightest are invited to sit the entrance exam, and just two are accepted as fellows each year. Fifteenth-century architecture mingles with Hawksmoor and Wren detailings for pure tranquility. There is no charge to visit All Souls College, which is open to guests for just a couple of hours during the day. Many travelers explore on foot, as part of a self-guided walking tour of the key Oxford colleges, but others enjoy the historical expertise and colorful anecdotes a guide can provide—some Oxford walking tours are led by current or former students of the university. Whether you opt for a walking tour or a bicycle tour, check carefully to see whether they enter the college, as many simply pass by. All Souls College is a must for history buffs and lovers of architecture. All Souls College is a place of study and reflection, so be mindful about noise. Steep stairs mean there is only limited wheelchair access to All Souls College. Phone ahead or ask your tour provider about access to the library. All Souls College is located in central Oxford, on the corner of High Street and Catte Street. Almost everyone explores the colleges on foot, or occasionally by bicycle, and it’s often easiest to arrive by bus or train. Most London trains start from Paddington, while the popular Oxford Tube coach service stops at Shepherd’s Bush, Notting Hill Gate, Marble Arch, and Victoria. Drivers typically leave their vehicles in park-and-ride zones outside the city. All Souls College closes at Easter, over the Christmas and New Year period, and for the whole month of August. Outside those times, it’s open to the public in the early afternoons only, excluding Saturdays. As with many Oxford colleges, it can get very busy on Sundays, and throughout June and July; visiting in the May or September shoulder seasons is recommended. Henry Chichele, then Archbishop of Canterbury, established All Souls College in 1438 as a center for prayer and learning. Celebrated fellows over the years include the architect Sir Christopher Wren, whose sundial is on display in the North Quad; T. E. Lawrence, of Lawrence of Arabia fame; and the philosopher Isaiah Berlin. Delight in the quintessential charm of England on a full-day tour of Oxford, the Cotswolds and Stratford-upon-Avon from London. With a knowledgeable guide, visit some of the country’s most popular attractions and delve into the rich history of the British Empire. Catch a glimpse of the grand buildings in the prestigious Oxford University; capture photographs during stops in two gorgeous Cotswolds villages; and visit the birthplace of iconic playwright William Shakespeare in Stratford-upon-Avon. Enjoy an intimate atmosphere on this small-group tour, limited to 16 people. Discover the quintessential charm of the English countryside on a full-day excursion to Stratford-upon-Avon and the Cotswolds from Oxford. With a knowledgeable guide, travel to Stratford-upon-Avon, the birthplace of William Shakespeare, to discover the rich historical heritage of the area. Stop at Anne Hathaway’s quaint cottage and then discover a selection of charming villages in the Cotswold’s region. Conclude your day with a comprehensive walking tour of Oxford and marvel at the architectural grandeur of the historical university city. For fans of Harry Potter, the Warner Bros. Studio London should be at the top of your England itinerary. On this 10-hour tour from London, you’ll travel with ease to the Making of Harry Potter and discover the exact sets used in the magical film franchise. Stroll down Diagon Alley, sit on the Hogwart’s Express, and ride the Knight Bus before heading to Oxford for a 1-hour walking tour of the historic university city. This family-friendly tour is limited to 20 people in order to maintain an intimate atmosphere. Oxford University and City Tour! This walking tour gives you an insider's view of Oxford University and the city. Your student guide will tell you what real student life is like within our historic university. Your tour will include plenty of history, but also stories and anecdotes to delight adults and children alike. You'll hear about the incredible history of the university, while also learning about a tortoise race, a duck hunt which takes place just once every hundred years, Harry Potter, Lewis Carrol, C.S. Lewis, J.R.R. Tolkien and much, much more!Our group sizes on these tours are limited in order to ensure that everyone has the best possible experience with their student guide. This does mean, however, that space is limited. 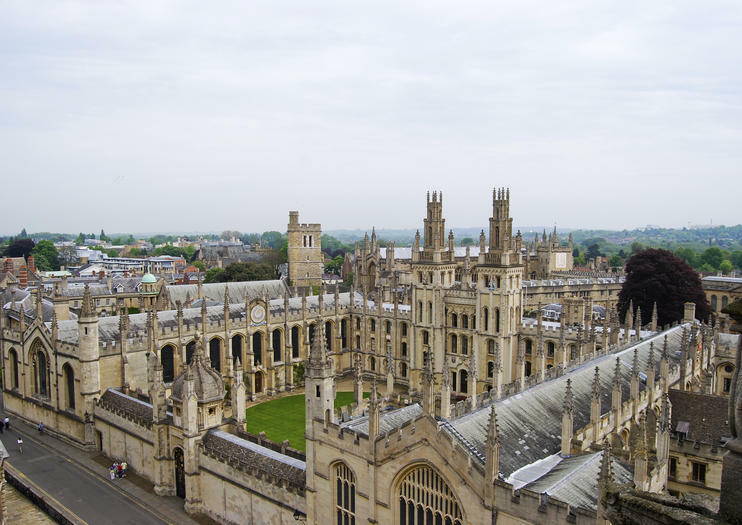 So book your tour as soon as possible.This tour covers all of central Oxford's major attractions and includes entry to one of our ancient colleges as well the oldest part of the historic Bodleian Library--The Divinity School, which also served as a Harry Potter film location. While there are many walking tours available in Oxford we noticed that there were no tours emphasizing the Christian history of Oxford. This tour emphasizes the specifically Christian history of Oxford and includes stories about the Oxford Martyrs (Archbishop Cranmer, Bishop Latimer and Bishop Ridley), the Oxford Movement and Cardinal John Henry Newman, William Tyndale, Cardinal Thomas Wolsey, King Henry VIII, and Queen Mary Tudor. But don't worry, this tour will also give you a fantastic introduction to the city and university and includes stories about C.S. Lewis, J.R.R. Tolkien, Lewis Carroll, Harry Potter and much more! Meet us at the Martyr's Memorial in Oxford on the corner of St. Giles and Beaumont St. See you there! Explore the world of ‘The Inklings’—the mid-20th-century writers’ group that included C.S. Lewis and J.R.R. Tolkien—on this private Oxford walk. Rather than researching locations yourself, let a guide show you where the writers worked and relaxed. Visit Exeter College where Tolkien studied; and see Lewis’ Magdalen College and other sights while learning history and literary tales you’d otherwise miss. A choice of departure times gives you flexibility. Explore the university city of Oxford on a tour that showcases its highlights in just a couple of hours. The waking tour introduces you to many of Oxford's famous colleges and university buildings as you stroll around the city with a guide. Get recommendations for things to do and see in the city in your own time, and hear insider tips for Oxford's many restaurants. The experience includes a visit inside one college and either the Divinity School or the University Church of St. Mary the Virgin. The best way to see Oxford is on a bicycle on this private bicycle tour along the River Thames Path. In fact, bikes are the locals' favourite way to get around the city as the compact Oxford is not very car-friendly. The tour lasts for 3-4 hours, including a guided tour plus bike set up time and a refreshments stop. The route covers both the city's sights and stories with a college entrance fee and a relaxing cycle along the River Thames to Iffley or Binsey Village. To book this private tour, you must select at least 4 adult tickets, in order to book. Otherwise, we sell small group individually ticketed tours too, from £40 per person with minimum of only 2 persons to book those tours.